AAAAAAawwwwwwww Eileen id love 3 of these in My Meadow :) A Mummy,Daddy & Baby 1 theyd look so @ home in there wouldnt they :)? aye Jacque they would look great there. the more the merrier i say . 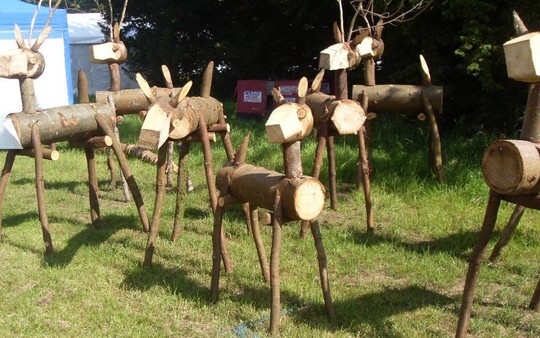 By the time weve all finished will be "raining" deer...(Reindeer??) Maybe not ! So thats it folks...a Christmas competition ! As Jacque says we can add bells and lights and then post our pics ! Who is to be judge ? Great ! Go for it ! So why has Jane just told me to go out to the log pile NOW ? lol i can see this is goin to be fun. Great idea San....gone on favs too ! No chance Jacque ! But what fun this comp is going to be ! Well my deers, looks like you are all going to turn into carvers and sculptors. May I suggest you have some plasters put by......just be careful. These are brilliant. Deers in the wood........wood in the deers. May I join in too? I'll just have to keep the wood away from my dogs or it will never get beyond the log stage! Hi Penkate, welcome to GOY. Great idea........count me in.....my fire will be toasty all winter practising these! Lol! I think I have solved all your problems of shortage of logs well most of you, just up the road from me they sell logs for the fires why not try one who sells them they advertise too. I wonder who will put the spots on their bodies, my favourite animal as well, I use to go to charlcote park to see them, as for waiting for winter I think its hear now with the weather we are getting, don't forget their antlers too ladies and gents. he he you then could hook bird feeders from them. Is Toto going to be Father Christmas he he he. Its a must to do before Christmas count me in. are you in too Morgana. Sorry Irish I will not be as I can hardly move in winter time through my atheritis as I have it not only in my hips and back but my neck and arms too, I will see if there is some thing smaller and softer wood to carve but don't hold your breathe as they say. Thank you Irish, I believe laughter is the best medicine and on here I laugh a lot at the comments made, I once said to a dissability doctor I like to make people laugh, he said laughter is the best medicine as it exercises every muscle in your body. hi Sarah, you could try asking council workers for some logs if you see them chopping trees in the autumn. you can also buy bags of logs. Dining room chairs? Would that work? Like me ( got that in before the rest of you.chipped in)! Sid if you use the chair legs make sure its strong you may have to have your christmas dinner sat on it. haha it was very creative dog, very cute! can ride? A bit late but I've only just noticed this, Irish. They're great! I shall look now , thanks.